Boil the potatoes for 6-7 minutes and drain. In a large frying pan gently cook the onion in the olive oil until softened, add the potatoes and continue cooking until the potatoes just start to crisp a little. Add the paprika, garlic, sweetcorn and chili and continue cooking for 2-3 minutes. Pour in the tinned tomatoes and bring to a steady simmer. When the potatoes feel tender, season with salt and milled pepper. Make 4 wells in the potato mixture and crack in the eggs. Making sure each egg is surrounded by the lovely potato mixture. Continue cooking until the egg is cooked but yet the yolk is soft, sprinkle with fresh coriander and serve straight from the pan. Delish served with crisp bread or corn chips. Place the potatoes into a bowl with about 100ml of water and cook for about 8 minutes, until they feel tender, drain. Add the olive oil, paprika, onion, garlic and chilli to the potatoes and cook for a further 3 minutes. Take a medium sized microwavable flat dish and tip the potatoes into it, Mix in the tinned tomatoes and sweetcorn and microwave again for 3-4 minutes. Now make 4 wells in the mix and crack an egg into each well. Cover and cook again for 2-3 minutes until the egg is cooked to your liking. Serve with chopped fresh coriander, crisp bread, pitta or corn chips. 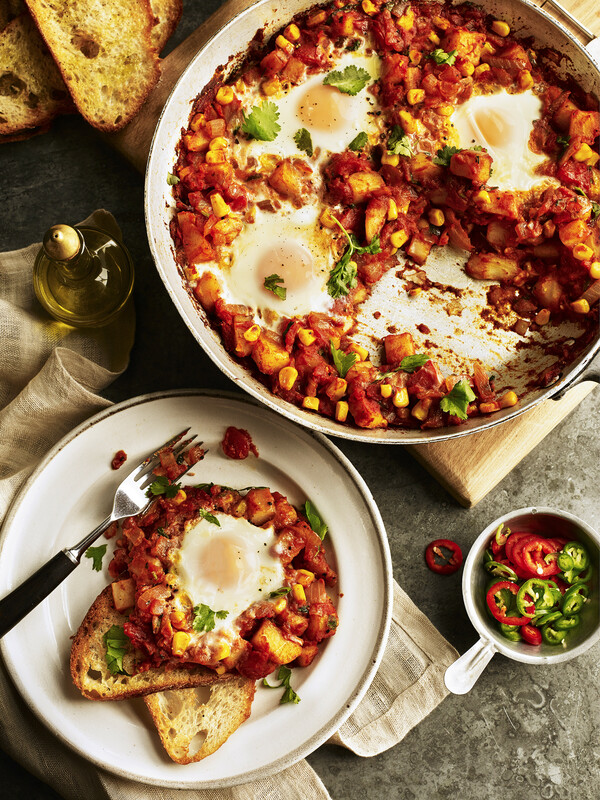 Check out the Huevos Rancheros recipe below and watch more video recipes here!